Adorama added more "Refurbished By Canon" camera bodies to their inventory - including a Canon 1D Mark III for $3,499 (back in stock) and a Canon 5D for only $1,629.95 (Great deal). Many other models are available as well. Adorama has refreshed their inventory of "Refurbished By Canon" cameras, lenses and flashes. There are currently 59 items listed - including a Canon 1D Mark III for $3,499. Expect like-new equipment at nicely reduced prices. With the help of a 12mm Extension Tube, you can physically mount this EF-S lens on a full frame body. But you probably will not want to. 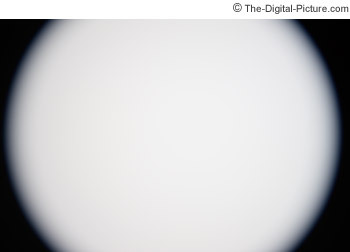 The image above shows the image circle as seen through this combination by a Canon EOS-1Ds Mark III. In addition to the heavy vignetting, AF does not work and the aperture information does not report to the camera. Even in MF mode, more hurdles remain - at 55mm, the 17-55 will not focus any farther away than about 7" or so in front of the lens. This distance rapidly decreases as the focal length is widened until the subject is against the glass and beyond this point no subject can be in-focus. It was a fun exercise at least - and now we know. Sigma announces the Sigma 50mm f/1.4 EX DG HSM Lens. 1. It now supports high-capacity CF cards. 2. It allows the latest lens names to be recorded in the Exif information of images taken. 3. It adds lenses that are compatible with the Digital Photo Professional 3.2 lens aberration correction function." 1. It allows the latest lens names to be recorded in the Exif information of images taken. 2. It adds lenses that are compatible with the Digital Photo Professional 3.2 lens aberration correction function." Adobe issues a warning regarding Camera Raw v4.4 and Photoshop Lightroom v1.4. Read the details at PhotoshopNews.com. Stuff for sale ... These offers are available within the cUSA. To be fair to everyone, all items will remain for sale until I receive a firm "I'll take it" under agreed-upon conditions. I will accept Paypal if shipping to the verified address. Use the email button at the top and bottom any website page to contact me. Like new with manual and caps - missing box. In excellent condition cosmetically and functionally. Scratch-free - If there is a scratch on the LCDs, you are going to have to look very hard to find it. Slight brassing is visible on the hotshoe as usual. The battery was purchased new on 1/31/2007. Includes box and all original accessories. Purchased new 6/8/2007. In excellent conditions. Great monopod. Like new with very lightly dirty foot. Like new with a little dust. Sold out: B&H has the Canon EOS-1Ds Mark III in stock. I posted a bunch of new sample pictures for various lenses and cameras. The new gallery will make viewing them as a group easy. Chuck Westfall's March Tech Tips are online at DigitalJournalist.org. Canon USA has updated the Canon EOS-1D Mark III Service Notice. We are aware that some customers have raised questions about the performance of the EOS-1D Mark III AF system under certain conditions. We will continue to investigate, and look for opportunities to improve, the performance of the AF system to ensure the satisfaction of all of our customers"
Adorama has over 20 Domke cases on special for at least 50% off. These are listed in Adorama's "Specials" section (use link at the top of the Adorama Home Page). Go to the bottom of page 5 to get to the start of the Domke gear. These are while supplies last - don't hesitate if there is something you want. All images were shot with the Canon EOS-1Ds Mark II DSLR along with a small set of lenses including the Canon EF 24-105mm f/4L IS USM Lens, Canon EF 70-200mm f/4L IS USM Lens and Canon EF 500mm f/4L IS USM Lens. RitzCamera.com is offering 10% off in-stock orders when you use PayPal Checkout. Free shipping on most photo items over $100. Click on the link at the top of the home page for details and a few restrictions. OneCall has the Canon 1D Mark III on sale for $3,868.77 shipped. $15 off $100 at Calumet Photographic plus free shipping over $75. The discount will not show in your shopping cart but will show in your confirmation email - PayPal users will be credited the next day. There is no code to enter - simply using this link generates the discount.